These collapsible rain water barrels are lightweight and easy to use. Great for watering a garden using rain water from a gutter downspout. They fold down for easy storage, and pop up quickly when needed. Rain barrels are available in 52, 104, 156, & 200 gallon sizes. 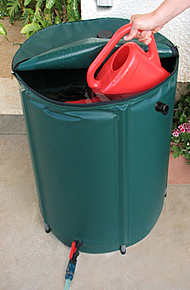 Each rain barrel is made from 3 layers of UV treated polyester which resists fading and cracking. Each barrel has a separate inlet and outlet, plus an overflow valve. A ball valve on the outlet makes it easy control the flow rate. The inlet is screened to catch leaves and dirt which keeps the bottom of the rain barrel from clogging. At the top of the barrel is a zipper for easy water access. A rain water diverter that allows the barrel to collect water from a gutter downspout is included. For Grow More, Solar Harvest, and Cross Country greenhouses. Hang baskets from the greenhouse roof with these unique plant hangers. They are secured into the aluminum channel of the greenhouse by simply inserting and twisting 90 degrees. Each package contains 10 hangers. U clamps can be used for hanging 1/2" or smaller pipe for water, misting, or electrical lines. You can also hang baskets or lights from the greenhouse roof with these heavy-duty clamps. They are secured into the aluminum channel of the greenhouse with T bolts for Grow More and Solar Harvest greenhouses and 1/2" cross country bolts for Cross Country greenhouses. Each package contains 10 clamps and 20 bolts and nuts. For Grow More, Solar Harvest, and Cross Country greenhouses. Special stainless steel bolts for attaching accessories like shelves, light fixtures, and additional supports to the inside channel of the greenhouse frame. Just insert bolt into the aluminum channel, turn 90°, and fasten the accessory to your greenhouse. Each package contains 20 bolts and nuts. Special stainless steel bolts for attaching accessories like shelves, light fixtures, and additional supports to the inside channel on the frame of Cross Country greenhouses. Each package contains 20 bolts and nuts.